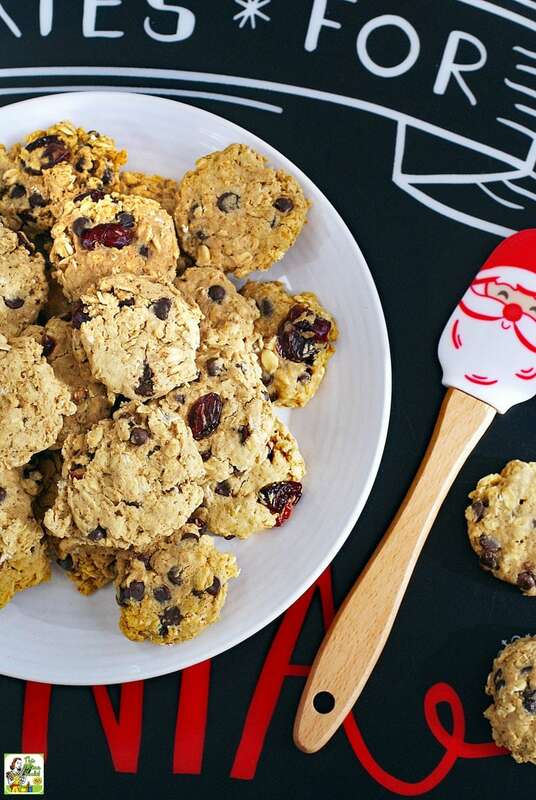 These Easy Oatmeal Cookies are ideal for Christmas cookie swaps. Since the holidays are a busy time, I’ve created a basic easy oatmeal cookie recipe that can be made different by changing one or two ingredients. 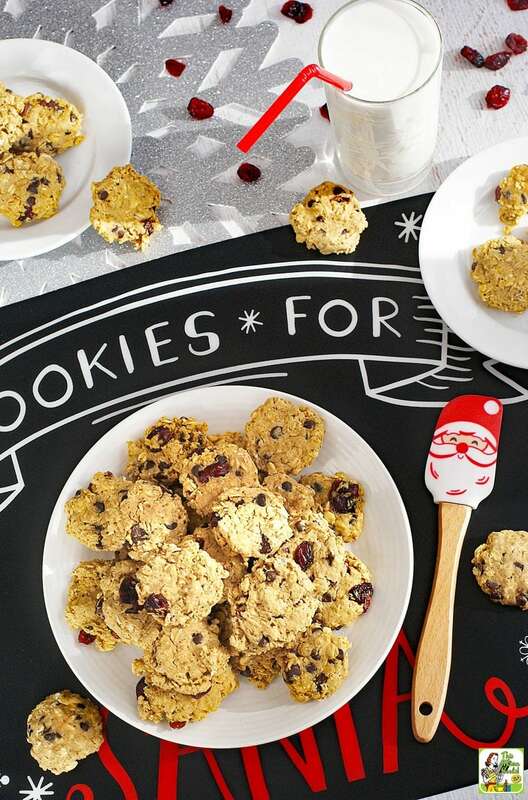 That way, you can bring oatmeal raisin cranberry cookies to one cookie exchange. Oatmeal raisin cookies to another. Chocolate oatmeal cookies to a third, and so on just by changing the “mix ins” as I call them. Not only are these healthy oatmeal cookies convenient to make, you can do flavor combinations making these cookies truly unique. If you have leftover raisins and chocolate chips, do a half and half mixture! Or combine cranberries, raisins, and chocolate. Try some unique mix ins like sugar free candied ginger, sugar free candied pecans, or unsweetened shredded coconut. For those of you who are nut free but like a crunch, try seeds like sunflower, pumpkin or pine nuts. You can also bake up a mixed batch of Easy Oatmeal Cookies by dividing the dough in half and mix 1/2 cup of this type of mix in and 1/2 cup of another type of mix in. To make this oatmeal cookie recipe as guilt free as possible, I’ve substituted monk fruit power for sugar and a buttery spread for butter. Since I try to make my recipes gluten free, I’ve used an all-purpose gluten free flour. I recommend Bob's Red Mill Gluten Free 1 to 1 Baking Flour for cookie baking. While oats are naturally gluten free, you want to use a brand like Bob's Red Mill Gluten Free Old Fashioned Rolled Oats that is certified to be gluten free. You should make sure all mix ins are gluten free. For chocolate chips, I like using Enjoy Life Foods Semi-Sweet Chocolate Chips. They’re also dairy free. If you want the healthy oatmeal cookies to be dairy free, use a vegan buttery spread. Easy Oatmeal Cookies make a great gift, too! For a gift exchange, you can put the dry ingredients for the oatmeal cookies plus one “mix in” (or a combination) in a Mason jar. Fold up the instructions and put them in an envelope with your holiday card. You may also want to include a label on the jar. 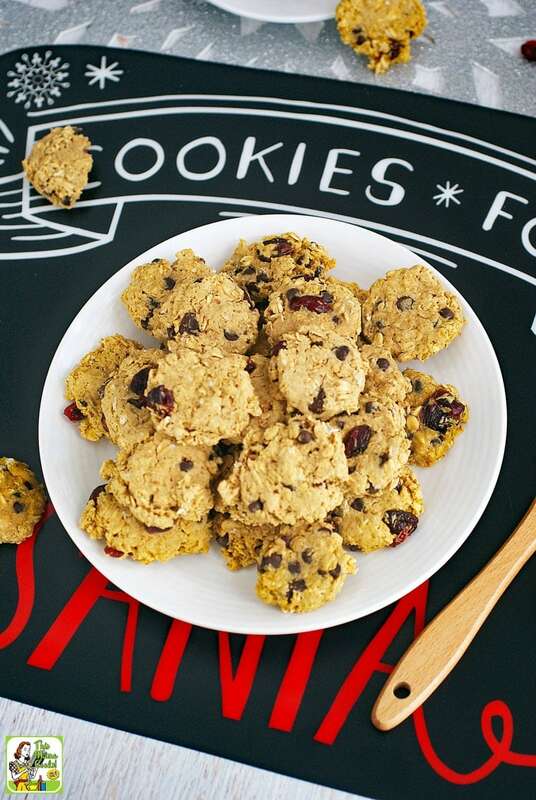 Try these other gluten free cookies for your Christmas cookie exchange! The best oatmeal cookie ever for cookie and gift exchanges! In another bowl, combine gluten free flour mix, baking soda, baking powder, soda, sea salt, and cinnamon. Stir until well blended. Pour the flour mixture into the butter mixture. Stir until well blended and smooth. Add in the oats and “mix in” of your choice. (I chose 1/2 cup dairy free mini-chocolate chips and 1/2 cup dried cranberries.) Stir until thoroughly combined. Refrigerate dough for 30 minutes. Position a rack in the upper third of your oven. Preheat the oven to 350 degrees F. Grease cookie sheets with cooking spray or use a silicon baking mat. Drop the dough by tablespoon onto a cookie sheet. With your hand, lightly press the cookie down to form a 1/2 inch thick cookie. One sheet at a time, bake 8-9 minutes. Prepare next baking sheet as the previous one bakes. The cookies are done when firm to the touch when gently pressed in the middle. Remove baking sheet from oven and let cool for 2 minutes. Then transfer the cookies to a cooling rack. Originally published on December 12, 2014. Updated with new pictures and information. I love the healthy subs you made here! 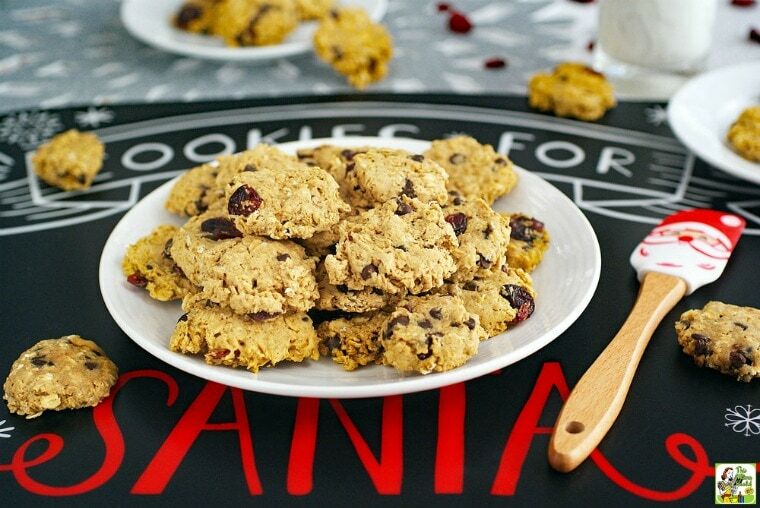 These cookies look wonderful – oatmeal cookies are so yummy, especially with things like dried fruit and nuts mixed in! These cookies look amazing!! Pinning! This recipe is genius! I need to buy me some Quaker Oatmeal now!!! Love how easy these are to make and healthy as well – win, win! I’ll have to look for these at Target! These cookies are exactly the sort of thing I love to snack on when my sweet tooth kicks in. These look SO good! And I’m intrigued by using monk fruit as sweetener. I need to get my hands on that! I wish we had Target and Quaker Oats over here where I live.